Breakfast may be the most important meal of the day, but lunch is what gets you through until dinner time. The price of school lunches rises each year and it is hard for some parents to keep up. This is besides the fact that many lunch menus, not just in schools either, are not as nutritious as they could be. Here are some money saving lunch ideas for frugal families. This goes for parents as well as kids. We are tempted to eat out with the group everyday, too. That adds up after awhile. Those cute insulated lunch bags make it easier to carry hot and cold items. We can throw even throw out the brown bags in favor of reusable options which are more environmentally friendly. When you pack your own lunch, you know what is in it so it is easier to avoid a lot of unhealthy fats and junk food. I’m not talking about just any sandwich. This can be a wrap, pita, crust less bread, or bun sandwich. Varying the bread each day will help you decide what ingredients to put on it. You may want turkey with alfalfa sprouts, tomato, and onion on a pita or chicken strips with barbecue sauce, lettuce, and shredded cheese in a tortilla wrap. Many kids like bread without crust for peanut butter and jelly sandwiches. This makes lunch fun and your kids are more likely to eat it if they have a creative variety. Invest in single packs of condiments. 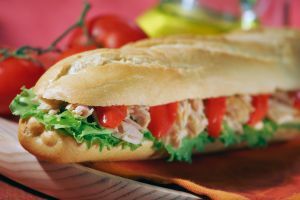 They can be used in lunches as opposed to putting them on the sandwich and saturating the bread before lunchtime rolls around. 3. Bottled water and drink crystals. Water has never been the same since they came out with those handy packs of flavorings. You can find them everywhere. Best of all they have five calories or less. You can turn a bottle of water into a drink that is better than soda. Kids love them too. 4. Dessert courtesy of home. Stop! Put down that candy bar and walk away from the vending machine. Instead, choose a better option. Homemade granola can be shaped into bars and used as an after lunch snack. How about dried fruit pieces? They are sweeter than candy bars and won’t spike your blood sugar. It’s okay to have a naughty treat every now and then, but even at those times you can choose a healthier option than chips or candy. Make a batch of homemade chocolate chip cookies and pack a few in your lunch. These nifty items will keep lunch from spoiling. The perfect complement to an insulated bag, they allow you to take yogurt or a sandwich with meat and not have to worry about it getting warm before it’s time to eat. Eat them with your sandwich and add some Ranch dressing for dipping. Lunch doesn’t have to come from the school cafeteria or the fast food joint around the corner to be good. Coming from home, it can be healthier, taste better and cost less. Now that’s a combination you can’t beat.